Whenever we tend to settle people, may it be a permanent habitat or in the passing, waste always gets generated. A fact of life is that waste is continually being produced and never completely disappears. Waste treatment often produces secondary waste. The environmental services industry is continually looking for better methods to control pollution and remediate sites where pollution damage has been done. With the limited land space at our disposal it becomes necessary that we must manage this waste in a fruitful way that benefits the settlement or at least does not harm it. The process of this management has several parts and few of those have been covered in this book. If we look at the waste management process the basic work involved is to make the waste harmless to the society. A minute observation can show that it comprises of several actions like collecting the waste, conveying it to a treatment location, treating and then finally disposing it in a harmless way. The structure of this book is in the same order. The first action is the collection of waste or sewage from their respective generation locations. This is dealt in the first chapter. Once a process of collection is identified the next step is to construct such systems/networks which can be done by the conventional e.g. open cut excavations or trenchless methods. This is dealt in the second chapter. 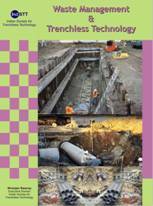 The next issue is the development of utilities or lifelines below the ground and their data management. This is dealt under Subsurface Utility Engineering covered under third chapter. Having ground profile details available and a developed subsurface network the next step in the management process would be to identify the defects of networks. This is done by various pipeline condition assessment methods like CCTV inspections, EM surveys. Once such defects are identified the major issue is of recording and reporting this data. For such requirements internationally a system is presently in use. The system is called as Uniform Defect Coding. The fourth chapter deals with these issues. Having identified the defects the obvious action would be to rehabilitate or renew the defective portions of the pipeline networks. Such issues are explained in the next two chapters. By undertaking the above operation one can be sure that his sewage is flowing to the treatment location which can be a sewage treatment plant. But that is not the end of the battle! One needs to treat it in the most appropriate manner and with the progress the quality of the effluent always goes down and therefore a continuous development of treatment processes. The next chapter deals with the latest processes of sewage treatment. The final and the most important part of this operation is the disposal of the refuse from the treatment. It should be disposed off in a completely harmless manner. These issues are dealt in the eighth chapter. One of the socially useful and productive uses of the refuse or end product from any waste treatment process is their use in construction activities. The ninth chapter deals with such issues. Through these nine chapters a concise discussion about the waste and sewage management trends has been presented. The intent is to provide information about the recent developments of the sector for educational purpose. Any design or process selection is not suggested and the reader is explicitly requested to use expert support or conduct further evaluations before considering using any of the methods/techniques presented herein. The details presented in this book are owned by respective organizations/individuals that have the copyright/patent of the respective material. Respective acknowledgements have been included in the acknowledgement section. This inclusion should not be construed as an acceptance of CIDC or its stakeholders about the methods discussed and the views presented. CIDC and its stakeholders will not accept any claim whatsoever for any losses arising out of the use of any of the techniques to the reader, his or her employers and others related or unrelated.